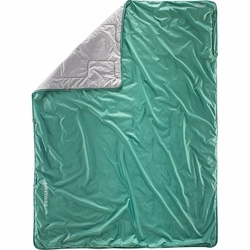 Therm-a-Rest Stellar Blanket. The ultimate in utility, the Stellar™ Blanket is a true star in its class. It combines packability, fast-drying technical fabrics and insulation to do everything a traditional blanket does–and so much more. Part of our Trek & Travel™ Series, it's equally at home on the trail in fair weather, around camp, on the beach, or anywhere you want a bit of technical performance with classic warmth and function. All blankets include perimeter snap loops for mating with other Therm-a-Rest blankets, quilts, sheets and Mattress Snap Kits.